The first time I ever made polenta was just after Brad and I got married. We lived in an apartment in the Highland Park area of St. Paul, Minnesota that looked out at the Mississippi River. The apartment itself was nothing special, but it did have these wonderful windows that spanned the length of each room. We were on the 16th or 17th floor...or maybe 15th...and from way up there the light coming through windows gave the illusion of living in some kind of penthouse on the top floor of a fancy building. Until you looked at the tiny kitchen and were quickly brought back down to earth. But we did have a lovely view. And it was our first home together. I was heartbroken when we left that apartment before moving to Tokyo in 2008 and literally sobbed the day we left. We had barely lived there for one year it felt like we were just settling in; like we had only just begun to make our newlywed memories in our first apartment. Of course, the experience of living in Japan quickly made up for leaving, but that apartment will always have a special place in my heart as the first place Brad and I called home. Since then, we've lived in four different apartments in Tokyo and now a small, cozy house in Colorado. In each of the places we have lived, there has been at least one meal that has stayed in my memory so clearly that I can smell and taste everything as though I just ate it yesterday. One of the first meals I made in our St. Paul apartment was a pot roast with porcini mushrooms and creamy polenta on the side. That was the first time I had ever made polenta. I remember the way it felt in my mouth and the impossibly creamy taste marrying beautifully with the tender pot roast. Such a perfect combination. I haven't made that exact meal since then, partially out of fear that I'll ruin the memory by realizing that it wasn't as good as I thought it was. I do, however, still make creamy polenta. It is fast and easy to prepare and you can top it with a number of accompaniments. My favorite at the moment is spicy arrabiata sauce, salty bacon, and a runny fried or poached egg. Heaven. In a bowl. For real. I actually got the idea for this dish from a restaurant here in Denver, but of course made a few changes to make it my own. 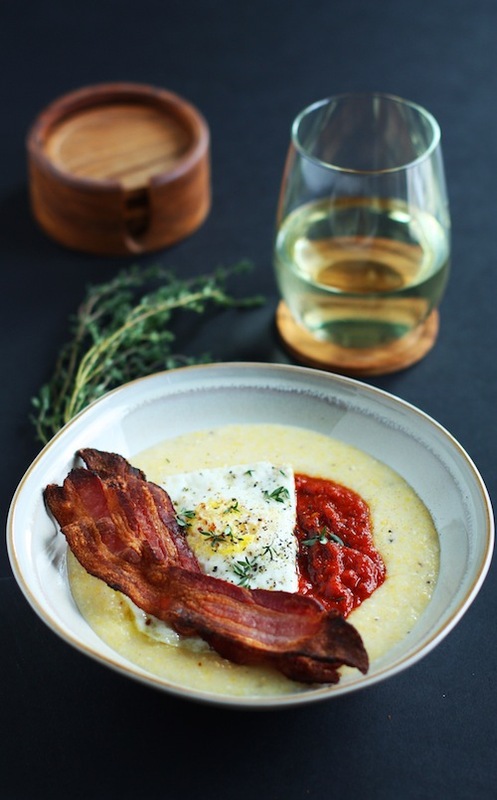 The addition of goat cheese adds a nice tang to the polenta, offering mild relief from the heat of the arrabiata and the salty bite of the bacon. The egg...oh, the egg...it melts into the polenta taking the creamy factor to the next level. I realize this is another egg dish, like last week's open-faced egg sandwich, but can you really have too many easy egg recipes in your arsenal? I also love that this hearty, satisfying meal can be on the table in only 30 minutes. 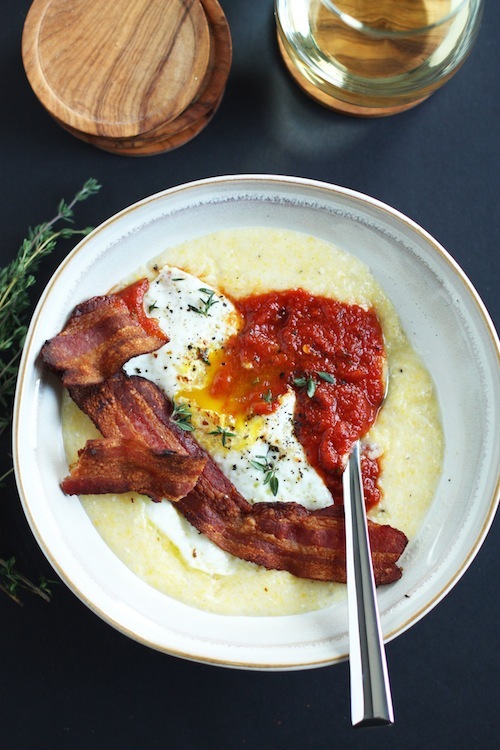 While the polenta simmers on the stove, the bacon is roasting in the oven (SO much easier, in my opinion, than cooking it on the stove top), the arrabiata sauce is warming over a low flame, and you are free to prepare the eggs. I mean, in all honesty, this meal practically makes itself. Aside from some stirring, timer setting, and generally overseeing the process, your job is quite simple. I promise you that even the most timid cooks out there can pull this off with no problems. Whether you're a veteran polenta-maker or a newbie in training, this dish is sure to become a family favorite. Bring 4 cups of water to a boil in a medium saucepan. Slowly whisk in the polenta, whisking continuously until there are no lumps and it begins to thicken slightly. Reduce the heat to medium-low and allow the polenta to simmer for 30 minutes, stirring occasionally to keep it from overcooking. When the polenta has thickened and become tender, stir in the goat cheese and cream cheese. Stir until the cheese are melted and fully incorporated into the polenta. Add salt and pepper to taste. Meanwhile, place the bacon on a parchment-lined baking sheet and place in the preheated oven on the middle rack. Roast for 15-18 minutes or until the bacon is golden and crisp. When it is done, remove it from the oven and place the bacon strips on a paper towel-lined plate. Set aside. In a small saucepan or in the microwave, heat the marinara sauce until just simmering. Keep warm until you are ready to assemble your bowls. In a large non-stick skillet, heat the 1 T olive oil over medium heat. If your pan is large enough, add the four eggs and allow them to cook until the whites are opaque but still a bit runny on the top. Put a lid over the pan and turn off the heat. Allow the eggs to continue cooking under the lid until the whites are set but the yolk is still runny. If your pan is small, fry the eggs in batches. To assemble the bowls, spoon even amounts of polenta in each bowl. Top with a spoonful of the arrabiata, 1 egg and 2 slices of bacon. Garnish with chopped thyme or parsley leaves. Serve immediately.